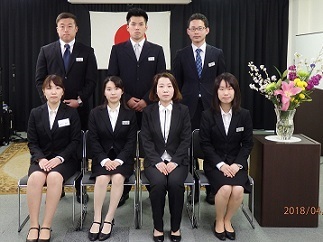 We had the entrance ceremony for the new recruits on April 2nd, 2018. 7 new people who joined our company, and our group company attended it this year. They will work on the initial training on the head office. For the future sales representatives, we will also carry out the technical trainings in our group company. Thought the four month long training, the new recruits will learn not only the sales techniques, but also the knowledge of valve manufacturing technology,quality control, and logistics.